Hickory Bar-B-Q’s sign, I would swear these days, glows a little brighter next to our Southwest Florida Bartending School. I’ve been tempted to ask if they replaced the red-neon tubing with a newer, more luminescent brand. Or maybe the effect is purely psychological. New owners, vastly improved food — maybe I just want to see that sign shine, so I do. Hickory reopened in October after closing in spring. 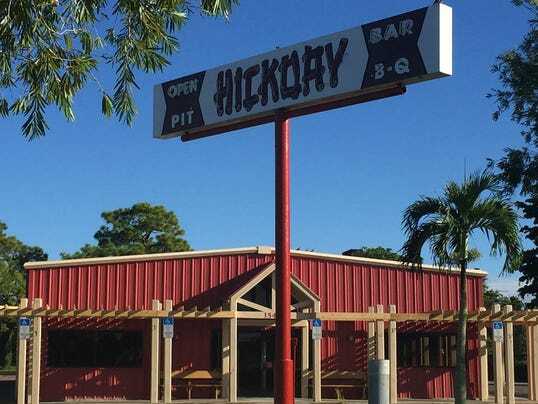 Despite a near-legendary local status, owed to 60 years of history in the Iona area of south Fort Myers, Hickory’s last decade has been fraught with uncertainty. Opened by Gertrude and Fate Davis and their son Bill in 1956, Hickory closed for the better part of the 2000s, reopening in 2010. When it closed again in April, I was sure it was the end. But former waitress Jenna Roberts and her husband, Corey, couldn’t let go. So they reached out to Bill, who still owns the building. They convinced him to share his secrets, to that warm love-it-or-hate-it Hickory sauce, to the finely chopped coleslaw, to the wood-fueled pits that scent all of Old McGregor with sweet smoke each day. They convinced Bill they could make a go of it, restore Hickory to its former glory. And boy are they close. Hickory Bar-B-Q isn’t a place you judge based on barbecue. Counterintuitive, I know. See, back in 1956 no one cared about smoke rings and bark and char. Barbecue wasn’t a sport. It wasn’t TV programming. It was about open flames and meat, icy glasses of sweet tea, and cream pies piled with meringue. Those seeking, wobbly, bark-crusted brisket have come to the wrong place. Hickory’s beef is slow-roasted then carved into thin slices. It’s well-marbled and wonderfully tender on good days (gray and a bit lifeless on others). And there is pork. Not just the standard Hickory sliced pork, which can get dry and crumbly as the day wears on, but now pulled pork, too — really quite good pulled pork. The kind that pulls apart in juicy strands. The kind you twirl onto a fork, then drag through puddles of sweet barbecue sauce before inhaling. Chicken and ribs round out Hickory’s lineup. Both wholly finish-able (were the portions not so big), though not especially amazing. But, like I said, you’re not here for that. You’re here for the fried okra, fresh bits of it dredged in corn meal, fried till crisp and served with spicy ranch. You’re here for hush puppies that first crack against your teeth, then give way to steamy, savory-sweet fluff. 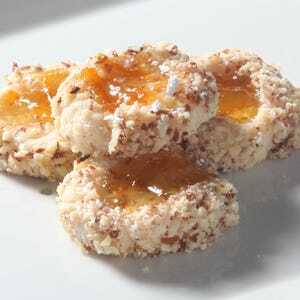 And for flaky biscuits that don’t need the pats of butter with which they’re served. You’re here for coconut-cream pie made from a gooey custard heaped with clouds of meringue. And for the fluffy, whipped-cream laden Key lime pie you scoff at, then greedily demolish. And the cookie contest winner is…. You’re here to listen to stories from the tables surrounding you. The widower pulling the oxygen tank who came here on a first date with his wife. The mom and dad who came in as kids and are now introducing their children to Hickory. You’re here because the Roberts family refused to give up on this place. Because they instilled the importance of hospitality into their warm and gracious servers. Hickory isn’t a place you judge based on barbecue. It’s a place you judge based on people, and that tingly sense of happiness you get when things feel right. And that’s where Hickory shines brightest.